The Emerald Coast Chapter is organizing a volunteer-run, coastal monitoring coalition to help patrol and protect our beaches. As part of the coalition creation, the Chapter is hosting a series of public coastal monitoring training sessions. These are some of the resources that are discussed, and that you may find are helpful as you monitor our local beaches. First of all, it is NOT suggested that you deliberately pick up the oil. Generally gloves are needed for that, as well as proper zip-loc bags for storage and sharing with responders. NITRILE gloves can be purchased at various dollar or grocery stores if you feel inclined to mitigate the MC252 oil from our Gulf waters or shoreline. If you find oil, make a note of the date, time and location (use GPS, compass coordinates, or use a landmark such as a crosswalk or access point). You’ll need this information later when you report the oil to the Coast Guard. If you find oil, please take a moment to call the USCG NRC at 800-424-8802 then Press 1 to make a report. This might take 3 minutes or so to do. Don’t be intimidated if you don’t have all the information. They might ask the temperature, or wind speed, or wave heights, but just have the needed information handy which is: DATE, TIME, and the PLACE by a GPS or compass coordinate, or a landmark such as a beach crosswalk. If you give your phone number, DWH Responders Petty Officers Burnett or D’Arecca will call you for additional details. They were at the meeting on Wednesday night and are happy to speak with you about the suspect oil you found on the beach. Eventually, we are hoping for a tar/oil “drop station” which could be placed at the EXIT of the Parks, or just after the exit, where one could conveniently drop it into some type of small box or unit. MC252 is generally brownish rust in color, not always, but generally in that tone. Black or glossy dark globs of oil substance often are result of bilge or other oiling activity. Peat will be crumbly, and often leaves black flecks on the sand it is sitting on. Not that all peat is merely organic roots and vegetation, but more times than not, the dark peat will not have oil inside. 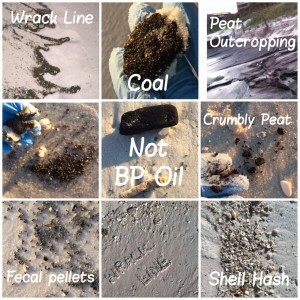 However it has been documented that MC252 (BP) oil has been inside of the peat. The only way to know is to break it open, and you might see a brownish-rust soft crude-oil smelling debris inside. It is not suggested that you go to that extensive investigation unless you have proper gloves on to avoid oil contact to your skin. 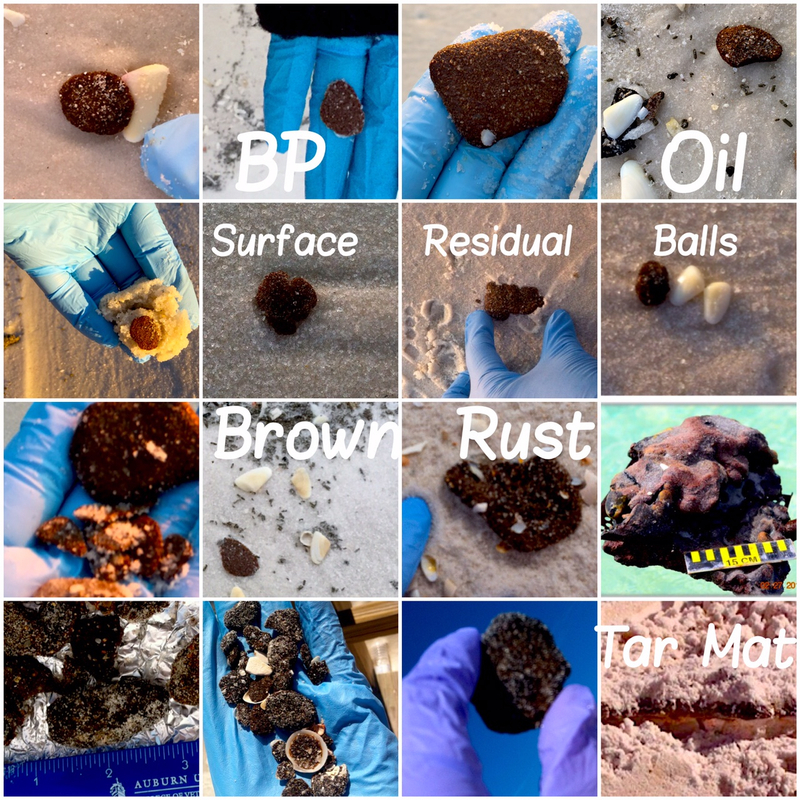 There are also rocks, charred wood, minerals that sit on our beaches which can resemble oil too. 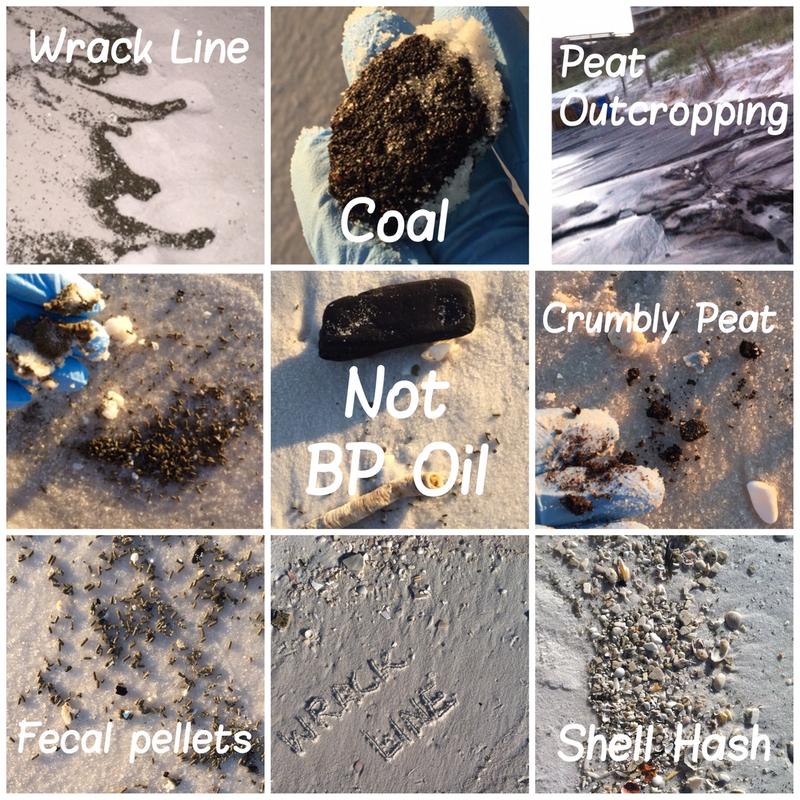 The oil will often stick to shells or since it weighs the same as a shell, you will find it mixed in with shell hash, or in the wrack line, where you see the shorebirds eat or crab resting- an area full of rich resources for our beach system. Generally it is suggested to take photos when you find the pollution on the ground/surf. Then take a photo of your surroundings of where you are for this pollution incident. Then take a screen shot of the specific place-either with Google Earth or Maps. This is discussed at the end of this post. If you see birds, crab, children, dogs at the place of the incident, please document that as well. If you see that people are causing problems around a sea turtle nest, or harassing any marine life/beach wildlife, please photo document that incident along with the Latitude/Longitude if possible. If you notice what could be sea turtle tracks- which look like scoot marks from large feet, or from some type of beach chairs, etc… try to take photos of that to share with officials, along with GPS/Lat-Long. Cigarette butts are one of the top pieces of pollution found on our beaches. The cigarettes also contain dangerous compounds, and if you have gloves and a way to dispose of them, the turtles and fish certainly don’t need that as part of their diet plan! Cans- it takes 400 years for an aluminum can to deteriorate. Plastics- We’ve all heard of the dangers of plastic, plastic rings used for cans etc… removing these things from our beach creates a healthy environment for all. Fishing lines- Again, we’ve seen the tragic results of fishing line inside marine mammals, or injuring shorebirds. Disposal is always appreciated. Balloons- These latex and mylar pieces of trash are very dangerous to sea life. Removing these items from our beaches is always a plus! More here on eliminating single use plastics! Please DO NOT attempt to assist the animals. Permit holders are the only ones who are able to touch any of the wildlife. First contact the Florida Fish & Wildlife Conservation Commission (FWC) to report the animal and for information on how to proceed. Sea Turtle Observations- nesting, harassment, strandings. Shorebirds- disruptions of nesting areas, harassment, injuries. Marine Mammal strandings or death. For more FWC reporting resources click here. Please text or call Susan if you have pictures of suspect oil, or peat, or to report anything unusual along the beach. Please contact Susan to discuss any concerns or suggestions on the Coastal Monitoring Coalition, as this program is in its beginning stages. 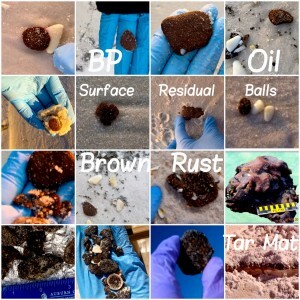 Follow us on Twitter @GulfCMC and use the hashtag #gulfcmc to track all pollution on our Gulf beaches. You can take a photo, and immediately upload it to twitter as a “tweet” on your own page. If you add @GulfCMC it will also be on our page. If you can hashtag it #gulfcmc this will allow your report or photo to be tracked and accessible. If you have an NRC number, you can add that to your tweet too. Then in the same tweet, press the little rectangle box with a mountain-scape on it, to add a photo of the oil onto twitter too. When you add a photo, this will reduce the number of letters you can use in your tweet to about 117 instead of the 140 characters allowed per tweet. We have been using this web based gulf oil spill tracking site since June 2010. If you scroll backwards through the pages, you will see a number of NRC Reports and oil sightings made from the Florida panhandle. Many include photos. These are from citizens such as yourself. You can add this to your phone if it is not a pre-loaded App. they refer to as the HOME button on the bottom center of your mobile device. Press both of them at the same time, and it should take a photo of your screen! Most Android and iPhones have this pre-loaded. It might not be on your first page, so scroll through your Apps to see where yours might be and calibrate it so it can be ready for beach use. Generally it should immediately show your Latitude and Longitude. You should have this on your device already, but most MAPPING will have the Latitude and Longitude of your location. in the least, it will have address to give for your NRC Report.